Do you have a ceiling fan in your home? Ceiling fans are helpful here in the heat of our Alabama summers. Ceiling fans work to move air throughout the room from the ceiling to the floor to create a breeze—this allows your body to feel cooler. We’re now moving quickly into winter and ceiling fans are also helpful in cold weather too. When you run your heater in the winter, you can switch on your heating fan to move the heat down into your living area instead of rising to the ceiling. Do you have enough outlets in your home? Are these outlets adequate? It’s important to have enough because it’s common because your requirements for electrical power to grow quickly. 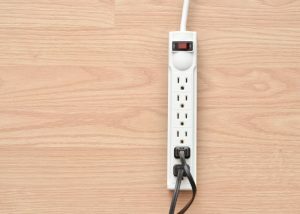 If you find yourself using multiple power strips and extension cords for your daily tasks around your home, you’re a good candidate for an electrical upgrade. Additionally, you might benefit from new outlets if your outlets are under par. Do you ever plug in an outlet and find your plug lying on the floor a few minutes later? It’s because your outlets lack grip and need upgrading. When the clip that’s intended to hold the plug wears out, this plug can feel loose. Don’t let this go unaddressed—it’s a big fire hazard. A power surge can destroy your electronics and cost you thousands of dollars in replacement costs. To avoid this disastrous occurrence, you should have whole-home surge protection. Power strips don’t provide adequate surge protection across your home, it only provides surge protection for small spaces. Our surge protection services will keep your home safe. If you live in an older home, it’s likely that your electrical panel could use an upgrade. Outdated panels have limitations on available space to add circuits or they have fuses. Many old panels are of low quality or simply stop working and need to upgrading. Your electrical panel is extremely important because it distributes the electrical power to the various areas of your home. Your electrical system is very important to your home so if you’re suffering from inefficiency you should have electrical services performed from our dependable team. You know what kind of weather we face—cold rainy winters with thunderstorms. Services like those mentioned above like whole-home surge protection, electrical panel upgrades, additional outlets, and ceiling fans will boost your home comfort and ensure your home safety. If you need a great electrician, then contact our team here at Douglas Cooling and Heating.